Make a gift through the Paypal – it’s secure and easy! Just click the button below and fill out our online donation form. Court Appointed Special Advocates of Sonoma County Inc. Please consider signing up for our “A Gift of Promise” monthly gift program for $125/mo to help provide a CASA volunteer to one child. Please fill out our online donation form or call CASA directly at 707-565-6375 for help in setting this up. Instead of a present, give your friends or family a “Gift of Promise” – a donation to Court Appointed Special Advocates of Sonoma County Inc., in their honor. For gifts of $50 and more, we will send the recipient a beautiful card acknowledging your gift in their name. Please fill out our online donation form or call CASA directly at 707-565-6375. Make a gift to the “CASA Rewards Program” which provides funds for opportunities for youth self-esteem enhancement, such as classes, camps, training. You can fill out our online donation form or to make a gift card or in-kind donation, please contact our Executive Director: Millie Gilson by email or at 707-565-6375. 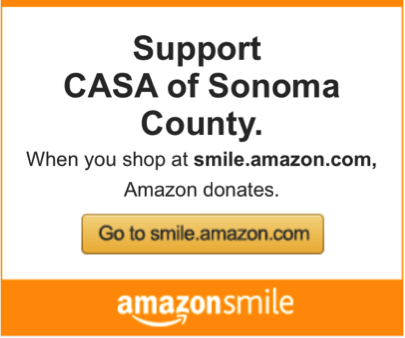 Give back to CASA of Sonoma County while you shop on Amazon Smile using the same account you already have with Amazon. 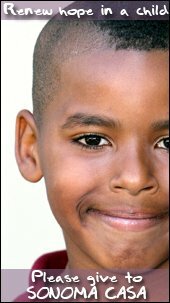 Just go to www.smile.amazon.com or click on this banner! On your first visit, you will need to select Court Appointed Special Advocates of Sonoma County, Inc. Amazon will remember your selection and then every eligible purchase you make, Amazon Smile Foundation will donate 0.5% of the purchase price to our program. A gift of stock or other securities can make a world of difference in our ability to serve foster children in Sonoma County. You can now make secure stock donations to Sonoma County Court Appointed Special Advocates via “Stock Donator“! Please designate “Court Appointed Special Advocates of Sonoma County Inc.” when making your donation to United Way. Simply provide the name of our organization exactly as shown above and our phone number, 707-565-6375, and United Way will make sure that your kind donation is directed to us. Please be sure not to state the acronym CASA, instead state “Court Appointed Special Advocates of Sonoma County Inc.“. We thank you for your generosity. Many companies offer matching gift programs to their employees. Check with your employer to find out if your company matches employees’ gifts to charitable nonprofit organizations; you may be able to double your donation to CASA. You can host an event on your own, with your school or group to fund raise on behalf of CASA of Sonoma County. We’ll make it easy by giving you guidelines and ideas.